3) This map shows another possibility. 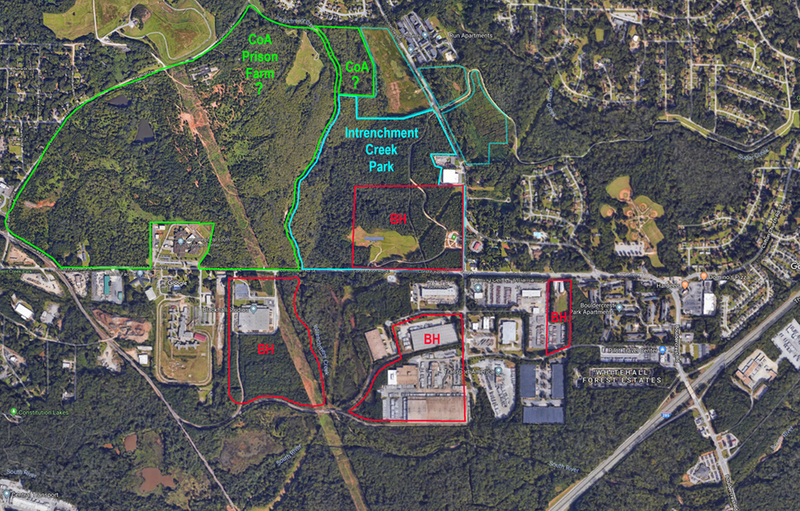 What if Blackhall could acquire and swap the land directly above Intrenchment Creek Park? That would join the Boulderwalk neighborhood directly to the park, without using Bouldercrest at all. It is currently owned by the City of Atlanta, along with the Prison Farm land to the west, along Intrenchment Creek. Say, that former target range would make a real nice RC Airfield- it's just about the same size! I bet the residents of Boulderwalk would much rather have that across the creek than guns and bombs being detonated by the APD! How about that for a land swap? Save the Prison Farm Benefit @ 529! Sign Up @ the Facebook Event Page & Share! Join us for a potluck picnic brunch, and then enjoy a tour of Intrenchment Creek Park and the Old Atlanta Prison Farm, guided by Scott Petersen. Walk the trails of this unique landscape and see the natural beauty for yourself! We'll start with the potluck picnic brunch @ 10:00am. Feel free to bring a dish to share! The Urban Land Institute, or ULI, is a nonprofit research and education organization. Its stated mission is "to provide leadership in the responsible use of land and in creating and sustaining thriving communities worldwide”. In September 2015 East Atlanta Community Association VP Dorian DeBarr presented an idea to the ULI to embark on a study (free of charge) surrounding the Old Prison Farm. We were then selected as one of the winners for their Atlanta “mini-Technical Assistance Program” (mTAP). This January I met with members of the mTAP team to brief them on our mission. They were excited to see the property, so I took them on a tour. Over the next 4 months, the team conducted interviews with many city and county officials, researched past projects and local demographics as well as related projects around the city of Atlanta and beyond (including a Prison Farm park that was created in Kansas City)! The end result was our Feasibility Analysis and Strategy booklet, which we can use to move our project forward. The mTAP team has also provided a list of contacts to meet with, and will provide introductions as we are ready. Click on the link above to read our online copy of the booklet. There are many interesting facts and points of interest that you may not be aware of- read on and let us know what you think! Life Drawing Events on Intrenchment Creek! On April 17th we had a plein air art group come out to paint in our beautiful park. Artists brought their easels and paints down the trail from the South River Intrenchment Creek Trailhead (maps under “Information” above). We invited lovely model Kate to pose against the scenic backdrop of the creek and the banks along the Old Atlanta Prison Farm. Beautiful paintings were created, and several visitors stopped by along their hike with friends and dogs. Take your next art excursion in this beautiful park! Life Drawing Event » Sunday April, 17! Greetings, fellow Prison Farmers! We are excited to bring you our new website. We plan to use it to keep you all updated on our activities and how you can help us to turn this area into a beautiful eco park. We will have more tours and special events in April and beyond. Hope to see you there!